If ’70s television is famous for anything except various people who were on Battle of the Network Stars, it’s for introducing the relevant, timely situation comedy to American broadcasting. These shows were mostly produced by independents who didn’t need the backing of a major film studio: Norman Lear and MTM Enterprises, mostly. But what did that mean for the studios that had dominated sitcoms only a few years earlier? And what, in particular, did it mean for the leading producer of ’60s sitcoms, Columbia Pictures’ TV imprint Screen Gems? Well, in the 1972–73 season, what it meant was Bridget Loves Bernie, known today—if it’s known at all—only as the show that got canceled after one season even though it was a top 10 hit. It’s hard to keep track of how many shows Columbia/Screen Gems had in prime time in the ’60s. They had Bewitched, probably their biggest hit; they had I Dream of Jeannie and The Donna Reed Show and Dennis the Menace and Hazel and The Monkees and Gidget and Hazel and The Flying Nun, and they distributed The Flintstones. The Screen Gems style was the essence of the old Hollywood B-movie style applied to TV sitcoms: make ’em fast, make ’em professional, and don’t get too topical and ruin the show’s shelf life. Screen Gems shows all used the same pool of sets and crew members, and they all had a certain charm and lighthearted wit—the writing was never super-smart, but it wasn’t dumb, either, and could sometimes slip a sophisticated joke in when the writer was in the mood that week. (They also seemed to be a little more progressive than most studios about hiring women as comedy writers; Barbara Avedon, Ruth Brooks Flippen, and Treva Silverman were among those who wrote a lot of scripts for them.) 1960s sitcoms were where we went to escape from the times, and no one was better at providing that kind of escape than Screen Gems. Now it’s 1972, and we find Screen Gems trying to make a comeback after a tough break: the struggling Columbia had sold off a lot of its studio space, forcing Screen Gems to rent space from Warner Brothers. Most of Screen Gems’ shows had been canceled; The Partridge Family was hanging on but didn’t have much life left in it. And things were getting tough for studio comedies. While big studios still dominated the expensive field of scripted drama, comedies had come along that were cheaper than studio shows, and more popular: by using videotape and never leaving the soundstage, the four-camera All in the Family could be produced for a lot less than a Screen Gems show. And much as people got burned out on the four-camera sitcom format in the ’00s, audiences and critics by 1972 had gotten a little worn out by single-camera comedy, which (as today) was the format of choice for film studios. The new independent sitcoms had the energy and the heat, while the one-camera studio shows were associated with sitcommy acting and contrivances (again, the opposite would be true a few decades later). Studios knew they had to get with the times, but they were a little unsure about what, exactly, they needed to imitate in the new breed of sitcoms. Paramount (in the second season of The Odd Couple) chose to imitate the format, setting up a three-camera, live-audience system. With one of its three big productions for fall 1972, Bridget Loves Bernie (the other two were The Paul Lynde Show and the M*A*S*H-esque hospital comedy Temperatures Rising), Screen Gems chose to stick with its usual way of making shows, but update the subject matter. Well, sort of update and sort of back-date, since as every critic pointed out at the time, the premise of the new show was over 40 years old, at least. Bridget Loves Bernie was about an attractive Jewish male (David Birney) who marries an attractive Irish-Catholic female (Meredith Baxter), and the culture-clash problems they have when his family meets hers. This was the premise of the play Abie’s Irish Rose, a Broadway show that became the biggest hit of the ’20s even though the critics hated it. And the idea had an additional advantage for the producers of Bewitched: it’s not only the same as Abie’s Irish Rose, it’s also the same as Bewitched. That show was also about a whirlwind courtship followed by an intermarriage, and the in-law problems that result. Like most shows in the cautious ’60s, it offered a sensitive subject in the palatable form of fantasy, allowing the writers to deal with intermarriage and cultural differences without getting specific about what they meant (some viewers thought it was about a Jew and a Christian; others thought it was about gays vs. straights; some Southern stations suspected it of secretly being about racial intermarriage). In the early ’70s, after The Godfather and before Star Wars, fantasy was out and the in thing was to tackle issues head-on. So the Columbia team, along with producer Doug Cramer (Love, American Style) simply decided to get specific about one of the issues that was behind their gentle culture-war humor. If you think of the show as a non-magical Bewitched, then the pilot starts to make sense. Essentially, like some of the early episodes of M*A*S*H—another single-camera studio comedy that premiered on CBS that year—it uses the comedy style of the ’60s but with a ’70s overlay. The ’70s elements include getting specific about the ethnicity of the characters, along with a bit more outdoor shooting. Everything else is ’60s: even Meredith Baxter, the beautiful blonde heroine, was the daughter of Whitney Blake, the beautiful blonde from Hazel. Throw in the inevitable attempts to imitate then-recent hit movies—a bit of Love Story, a bit of Guess Who’s Coming to Dinner—and you’ve got a pilot. The pilot of Bridget has some utterly terrible jokes, mostly when Slade tries to get with-it and imitate All in the Family: the ethnic jokes, the bit when Bridget’s father (David Doyle) thinks his daughter is marrying a black man, the line “do you take one or two lumps in your Jew?” (a straight steal from All in the Family, except not funny). It’s not quite as terrible as its reputation, but it’s not as confident and charming as the Screen Gems product of the ’60s—it has none of the charm of Love On a Rooftop, a romantic sitcom that was Slade’s own favorite of his creations. (Slade would soon leave TV and become a very successful playwright; his first play, Same Time Next Year, was one of the biggest hits of the decade.) It’s a cutesy show full of cutesy acting—way too cute to follow All in the Family, though it’s not impossible to see how it could improve. The reviews weren’t even all that bad originally. The show didn’t improve, though. Unlike Fox, which gave Larry Gelbart free rein to toughen and improve M*A*S*H after its shaky start, Screen Gems never really bought into the idea of a strong writer controlling a show (which may explain why Danny Arnold only lasted a year on Bewitched), and Slade was not going to do it one way or the other. “[Bernie] wrote the pilot but smartly declined to get involved with the series,” wrote Arnold Kane, another Canadian comedy writer who became a writer-producer on the show. “He was happy collecting his handsome royalty. Bern likes to sleep late and still does.” He would write episodes when asked, but he would never run a show. That was fine, maybe even part of the point, in the Screen Gems system. But it meant that the show was at the mercy of freelance writers. That too was fine in the ’60s, when there were more good freelancers; not so fine in the ’70s, when the newer sitcoms had put a lot of the best people on staff. So as the show bumbled along with weak scripts, it got good ratings in its wonderful hammock slot, but its level of respect was about on a level with Suddenly Susan or ¡Rob! or any other time-slot hit you’d prefer to forget. Arnold Kane wrote in his memoir, My Meteoric Rise to Obscurity, that even though the show was a ratings hit, “no one in the business liked it.” Cramer, bothered by this, asked Kane and his partner Gordon Farr to run the show, and the new writers decided that the problem with the show (apart from Birney, who considered himself too good to do television) was that it was weighed down by the in-laws: the Bewitched formula of using eccentric middle-aged actors was distracting attention from the only thing the show had going for it, the attractive young couple. “We informed Cramer and Columbia that we’d only come back if we could ‘ship’ Bernie’s family to Florida and bring them back if a script need them,” Kane wrote. CBS executives, understandably, didn’t care for the idea of massively retooling a hit show. In his autobiography, Shared Laughter, Bernard Slade recalled attending a Variety Club meeting in Toronto and hearing a rabbi referring to him as “a man who, in his honor, had three thousand trees uprooted in Israel. '” John Mitchell, who was president of Screen Gems at the time, dazedly told the Times that “while we recognize that interfaith marriage is a reality in today’s society, I don’t for a single moment believe that Bridget Loves Bernie is advocating it or that any couple would be influenced by it.” In other words, he found himself using the same boilerplate language that producers of dramas were using to respond to the TV-violence police. Part of what happened here is just that TV executives don’t recognize certain social trends until it’s too late: in this case, they probably didn’t get that there would be a more specifically religious backlash than there was in the ’20s. But the backlash may have been stronger because the show acted like it had no idea that there was anything sensitive about the issue. 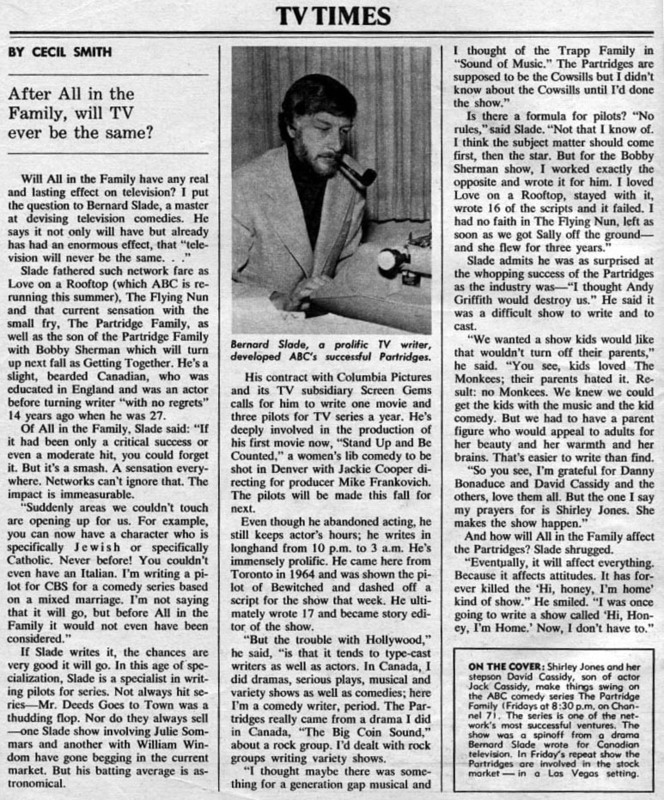 All in the Family was controversial, but it was also openly tough and rough, looking for trouble—they expected the angry letters. Bridget was, in style and tone, a ’60s Screen Gems show given a ’70s makeover: the subject matter was controversial, but the writing and filming proceeded as if everything was adorable and escapist. The spokesman for the Synagogue Council of America disgustedly told Fiske that the show “treats intermarriage in a cavalier, cute, condoning fashion, and deals with its inevitable problems as though they’re instantly solvable.” A typical Screen Gems sitcom, that is. That’s the way Bewitched did it. Only this was, theoretically, a real world, and the writers weren’t prepared for the fallout that happens when a comedy dips its toe into the real world. There are various legends as to why and how the show got canceled, but the story I’ve heard most often is the one about CBS founder William Paley, who, Kane wrote, was unnerved by the protests; he got “tired of getting out of his limo every morning and having to walk through a picket line of angry Hasidic Jews on his way to his office.” The story goes that the protests got Paley’s attention enough that he decided to actually watch the show, and after screening the thing, he decided to overrule his executives and cancel it. That’s the story, anyway. I would speculate that the protests just made the thing more trouble to keep than it was worth, since nobody believed that its ratings had anything to do with its quality: with the best time slot in the world, anything could have made the top 10 that season. CBS didn’t really have another night that was appropriate for it, and it would probably have tanked on any other night anyway. The cancellation looked weird because the ratings were high, but that’s what happens with a time-slot hit that no one loves. This cancellation probably benefited CBS in the long run. With Bridget gone, they used the 8:30 Saturday slot for the second season of a show called M*A*S*H. That show had struggled in a truly awful time slot (after a sitcom adaptation of The King and I) but took off after All in the Family. It was that following 1973–4 season, with M*A*S*H at 8:30 and The Carol Burnett Show shifted to Saturday, that CBS had what is possibly the most famous single-night lineup in TV history, though it only lasted a year. So in the end, the winner of the battle to create a hit big-studio, single-camera comedy in the new era was Fox, whose TV division was able to live off M*A*S*H for the next decade. Screen Gems’ next move was a bit schizo: the following year it went all in on trying to bring back the ’60s by hiring back Sally Field and (with Slade writing, again) starring her in an old-fashioned supernatural comedy, The Girl With Something Extra. They also took a very tentative step into MTM-style multi-camera comedy with a TV adaptation of the movie Bob & Carol & Ted & Alice. Both shows bombed, and the Screen Gems name was folded into the more prosaic Columbia Pictures Television; the studio would find some success in drama production, but as a sitcom supplier, Columbia had few hits and would spend most of the next decade distributing shows by independent producers like Susan Harris, Danny Arnold, and Lear. The Columbia sitcom empire was laid low, destroyed by changing times and the backlash against the Birneys. Great, informative write-up. I watched about a few minutes of the show before I couldn’t take it anymore. The line about “head in the oven” is also a steal from a line from Mel Brooks when he told his mother he was marrying Anne Bancroft. Speaking of Mel Brooks, if you are looking for future subjects, can I suggest “When Things Were Rotten.” Silly show, but I loved it at as a kid, and was very Mel Brooks. Had a great theme song. You also mention the “Paul Lynde Show.” The one I saw on Youtube was actually quite funny, but all because of him, naturally. Might also make a great subject. A really enjoyable essay. Note that in addition to “M*A*S*H,” CBS also debuted “Maude” and “The Bob Newhart Show” in the fall of 1972, so it hardly needed to keep this one around no matter what its ratings. Great article and analysis of the show. I was a kid back in 1972 but the big thing I remember was the relationship between Meredith Baxter and David Birney. You could tell they were falling in love together. I also vaguely remember some Catholic criticism of the show too. Also as a kid, I might have been immune to the specifics of the problem since my Catholic uncle married my lovely Jewish aunt in the 1960s and I married a great Jewish girl in the 1990s. I think this show in particular helped to break down some of the stigma of a “mixed marriage.” Certainly my wife and I have not experienced any discrimination that we know of. From what I have read, “Bridget Loves Bernie” got cancelled due to a combination of the religious protests it recieved and so – so script writing. My thoughts are that most people tuned in out of curiosity, and once the novelty had died, the show would have flopped as it is. Many shows in fact, have done well more due to the time slots that they were assigned rather than the quality of the show’s writing, acting and overall production. “Bridget Loves Bernie” was in one of those slots that no matter what the show could not have failed in the ratings. The article pretty much describes the show dead on, but technically it wasn’t a flop since it came in at number five of all shows on at the time. As somebody who was just starting puberty, Meredith Baxter wasn’t such a bad thing to watch. The show may have been dropped because of the controversy, but the lack of it would have been a death sentence anyway. Then it would have been a bad show about nothing. Wow! The highest rated sitcom in known history was cancelled due to complications.